The CBI’s reach to multiple subgroups was comparable to that reported by all hospitals in Connecticut. The table below shows the statewide proportions on several child/mother health indicators as compared to those for the ten CBI hospitals. Public pay birth (Medicaid-paid delivery) proportions, as an indicator of promoting equitable access to BFHI resources among low-income women, are also included. Of the ten CBI hospitals, seven reach a primarily urban population and three reach a primarily rural population. *Includes births that occurred at 29 acute care hospitals, one birthing center, and at home. Coordinating monthly conference calls and bi-monthly in-person workshops for key hospital contacts for purposes of collaboration and peer support. The materials supporting this intervention have been carefully developed by the Connecticut Department of Public Health and the Connecticut Breastfeeding Coalition. They are meant to serve as example documents, not exact guidelines for successful intervention replication. CBI Hospital Assessment Form.This is the assessment form the CBI used to select hospitals for participation in the Baby-Friendly project. Training for Ten Steps Projects.This document was compiled by the CBI consultant and provides several training options (online and in-person, with a range of pricing) for fulfilling the training required as part of the Baby-Friendly process. Sample Baby-Friendly USA Self-Appraisal.Please contact Baby-Friendly USA for information about the Self-Appraisal tool. Sample tool available on Baby-Friendly USA website: http://www.babyfriendlyusa.org/get-started/d1-discovery. The evidence summary provided below is based on the evaluation report compiled by Professional Data Analysts. Hospital Level 4-D Pathway and Practice changes: All 10 hospitals achieved Steps 1, 5, 6, 9 and 10 of the Ten Steps of the Baby-Friendly process, and all were working on achieving the remaining steps. At baseline, one hospital had begun the BFHI journey through the Certificate of Intent process (this process was not associated with any Phases, just completion of the Ten Steps and fair market purchasing of infant formula). The remaining nine hospitals were not yet on the BFHI journey, but entered Discovery (the first Phase of the 4-D Pathway) as part of CBI. At the conclusion of the CBI project, the Certificate of Intent hospital had achieved Baby-Friendly designation. At the end of the project period, one of the remaining nine hospitals was in the Development Phase, seven of the nine were in the Dissemination Phase, and one was in the Designation Phase. Hospitals reported that 583 individuals had been trained in some way (either by the CBI consultant, a person at his/her hospital, or online) and were eligible to complete the maternity staff survey. Of those individuals who received training, 230 completed the survey and were included in the analysis. These respondents received all 15 lessons through one method or a mix of methods. The retrospective, one-time survey asked respondents about the extent to which they performed the Baby-Friendly practices before and after the Baby-Friendly training. 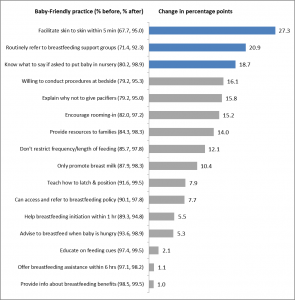 Practice changes among survey respondents are reported in Figure 1, and confidence levels in Baby-Friendly practices among survey respondents are reported in Figure 2. Figure 1 below shows the percentage point increase in respondents who strongly agree or agree that they perform the Baby-Friendly practices, as reported after the 15-hour training. The percentages of maternity staff reporting strong agreement or agreement on the practice before and after are reported in parentheses, while the percentage point increase is shown by the bar on the right. Figure 1. Percentage point increase in respondents who strongly agree or agree that they performed Baby-Friendly practices before as compared to after the 15-hour training. Figure 2 below shows the percentage of trained maternity staff who are reported being somewhat or very confident in their ability to perform the Baby-Friendly practice. As shown in figure 2, at the conclusion of the initiative, nearly all respondents were somewhat or very confident that they could explain the advantages of breastfeeding for mother and baby and educate a mother on the relationship between skin to skin and breastfeeding initiation, and that they understood the role of the hospital lactation consultant. Figure 2. Percent of trained maternity staff that are very or somewhat confident in their ability to perform the Baby-Friendly practice. Hospitals do collect data on breastfeeding initiation and exclusivity; however, these data were not part of the evaluation report that was reviewed. CBI Hospital Breastfeeding Committee Fact Sheet– Describes the methods, protocol, and rationale for interviews with each hospital’s breastfeeding committee or representatives. CBI Hospital Breastfeeding Committee Interview Questions– Provides the script and interview guide for interviews with the hospitals’ breastfeeding committees. CBI Maternity Staff Web Survey– Provides the rationale for and introduction to the survey, along with the survey questions. Center TRT developed an evaluation logic model and evaluation plan for the Connecticut Breastfeeding Initiative (CBI), a systems approach to assisting hospitals become designated as Baby-Friendly. The logic model is intended to guide the evaluation process (as opposed to the planning process); the evaluation plan focuses on the implementation and effectiveness of an approach like the CBI in changing hospital/maternity facility policies and practices to be supportive of breastfeeding initiation and exclusivity. The evaluation addresses the reach, adoption, extent of implementation and effectiveness of the CBI project in changing policies and practices related to breastfeeding promotion with new or expectant mothers. The evaluation is a pre-post design with no comparison group. This evaluation plan provides guidance on evaluation questions and types and sources of data for both process and outcome evaluation. If you are interested in answering evaluation questions not listed in the evaluation plan, please refer to the list of additional evaluation questions here. We suggest a variety of data collection tools throughout the evaluation plan.